A scholarly or academic publication presenting commentary of emerging or topical developments in the law, and often specializing in a particular area of the law or specific to a jurisdiction. The information is presented in the form of essays or articles. Those edited and published by a law association such as a bar association or law society, such as The Advocate (published by the Vancouver Bar Association). The Advocate raises an important distinction as it is part law journals and part law or legal magazines. Many legitimate law journals have occasionally compromised their content with some form of generic legal information, magazine-like content. This is a consistent feature of law journals which are published by law societies or bar associations. 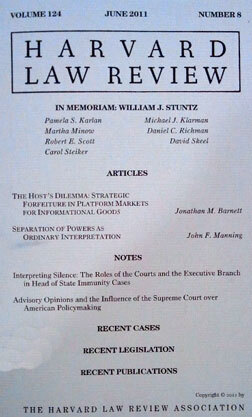 Historically, law journals have been presented in newspaper format (this is also true for some law reports). "(A law) journal offers an opportunity for unbiased reflection on specific legal issues, which is critical to the proper development of the law." Cohen, M. and Cohen, K., Legal Research, 8th Ed. (St. Paul: Thomson-West, 2003), page 37-42. Mersky, R. and Dunn, D., Fundamentals of Legal Research, 8th Ed. (New York: Foundation Press, 202), pages 363-395. Mills, Robin and Schultz, Jon, South Carolina Legal Research Handbook (Buffalo: William Hein, Law Book Publishers, 1970), page 14.